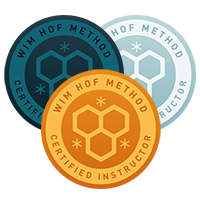 To meet the growing demand for expert teaching and guidance, we developed a program that allowed capable teachers to gain knowledge of the theory and practice of the Wim Hof Method, to a point where they could professionally, responsibly & reliably help spread Wim’s message. Thus was born the WHM Academy. Since its launch in 2013, over 200 people have successfully completed the program. WHM Instructors now teach the Wim Hof Method under official license all over the world. Qualified and capable, these certified Instructors typically offer small, intimate workshops that can be tailored to your specific wishes— sometimes in conjunction with related disciplines, such as fitness or yoga. New activities are continually added to our interactive map. Find a workshop near you and receive expert knowledge, personal guidance, and immediate feedback. Whether you are looking to improve mental or physical performance, relieve symptoms related to an illness, or simply want to spend your day doing something different and exciting— we have you covered. Highlights of each activity are depicted in easy to understand icons. There are icons for the theory behind the method, breathing, yoga, meditation, endurance, ice baths, nature, and food. These highlights are explained in more detail when you click on a specific activity. In this workshop, the pillars of the Wim Hof Method will be expanded and elaborated upon. You will learn new and advanced Wim Hof Method techniques. Upon completion, you will have the tools you need to improve your energy flow, flexibility and focus. Gaining this awareness will help you enhance the mind-body connection. Put yourself in the expert hands of a certified WHM Level 2 Instructor, and learn more about the 3 pillars of the Wim Hof Method: breathing technique, cold exposure & commitment. Find out how you can expand your Wim Hof Method practice and learn about the underlying physiology. The intimate quality allows for ample personal attention, and feedback tailored to your specific situation. Whether you are looking to improve mental or physical performance, relieve symptoms related to an illness, or want to know more about the Wim Hof Method techniques— a WHM Advanced Workshop offers something for everyone who wants to expand their Wim Hof Method practice. The specifics of each program vary based on the specialization of the Instructor and the focus of the activity. Put yourself in the expert hands of a certified WHM Instructor to learn the 3 pillars of the Wim Hof Method: Breathing Technique, Cold Exposure and Commitment. Find out how you can utilize oxygen and cold exposure to optimize body and mind, and learn about the underlying physiology. This two-day, in-depth session will be will be jam-packed with insights, scientific explanations and advanced techniques to help you master the groundbreaking breathing-, focus-, and cold adaptation techniques to increase vitality, control stress, influence the immune system, and uncover the hidden abilities of your physiology. An incredibly simple yet effective and scientifically proven way to unleash your personal potential. If you have completed one of our video courses, and have been practicing on your own, this Weekend will provide answers to your questions, questions to your answers, and take you to the next level. Everybody can participate at their own level; no pressure, just a lot of fun! We do expect participants to be familiar with the basics of the Wim Hof Method, either via one of our online video courses or a Fundamentals Workshop or Weekend. Looking for more supervision and coaching in your Wim Hof Method practice? In the 5- or 10-week Group Course you will meet up with fellow WHM-practitioners, and train together in a series of classes once per week. You will gain a theoretical understanding of the Method, compounded by a synergy resulting from your shared experiences. Homework provided after class allows you to progress on your own throughout the week. Classes progress such that, by the end of the course, you will have sufficient knowledge and tools to maintain a practice independent of supervision. Catering to those who are looking for the ultimate Wim Hof Method experience, our biannual Expeditions provide an adventure that goes above and beyond any workshop. You will be trained and supervised by the most experienced mentors, accompanied by likeminded yet unique individuals, and surrounded by a natural environment perfectly tailored to this extended immersion. Together, this synergistic set of circumstances is ideally suited to stimulate all the physical and mental benefits associated with the Wim Hof Method.